Hover over Reports and select the Category of Report you'd like to access. The first page will be an overview of data in that category. Click the dropdown menu at the top right to access a specific report. Set the date range you'd like to view in the popup that appears. You may print or export the report to Excel using the buttons at the top of this window. Profit by Order: This report displays the total price of products purchased versus the internal costs for each order. The report subtracts the cost from the price to display the profit per order. Profit by Day: Displays the total price of products purchased against the internal costs for each day. The report subtracts the cost from the price to display the profit for each day. Individual order numbers are not included in this report. Profit By Month: Displays the total price of products purchased versus the internal costs for each month. The report subtracts the cost from the price to display the profit for the month. Individual order numbers are not included in this report. Top Categories: Displays the number of products and the total value sold within each category for the chosen date range. Rewards By Customer: Lists each customer that has used the rewards points feature and displays their name, company, number of points earned, number of points used, and the balance of points for the specified date range. Rewards Overall: Displays number of points given, number of points used, and the balance of points for the specified date range. This report does not list any customer details. 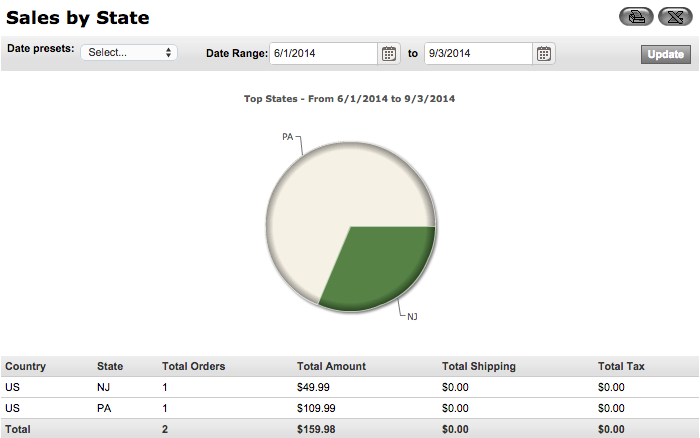 Top Customers: Lists all customers that have placed orders within the date range specified. The report displays the customer name, company, number of orders placed from the customer, and the total amount spent. Top Groups: Lists all customer groups that have placed orders within the date range specified. The report displays the customer group name, number of orders placed from the customer group, and the total amount spent for the customer group. Newsletter Signups: Displays the number of customers that signed up for the newsletter feature for the specified date range. Low Inventory Alert: Lists all products with a stock level lower than the designated stock alert number. This report displays the product ID, Secondary ID (if there is one), product name, current stock level, and the stock alert number set for the product. This report can be filtered by distributor and can display all products with a stock level lower than a number specified, regardless of the stock alert number set. Inventory Report: Lists all products in the store and displays the product id, product name, stock number, cost, total cost of all products on hand, price, and total price all products on hand. Newsletter signups: Displays the number of customers that signed up for your store's newsletter for the designated date range. Orders By Date: This report sorts orders by Promotion to list the orders for which the promotion was applied. The report will display all orders placed within the timeframe specified. The report displays the order number, customer name, payment method, subtotal, shipping amount, tax, order status, and order total. Sales By Product: Lists all products sold for the date selected. Displays the product ID, product name, and the quantity sold of each product. Sales By Promotion: Displays the number of times each promotion has been used on orders for the selected dates. The report displays the promotion name, number of orders the promotion was used on, the value of discounts the promotion created, number of orders that received free shipping due to the promotion, and number of orders that received a free product due to the promotion. This report does not list specific order numbers. Sales By Referrer: Lists number of sales generated from each referrer URL for the date selected. This report displays the referral URL, quantity of generated orders, total value sold on the orders, total shipping value on the orders, and total tax value on the orders. 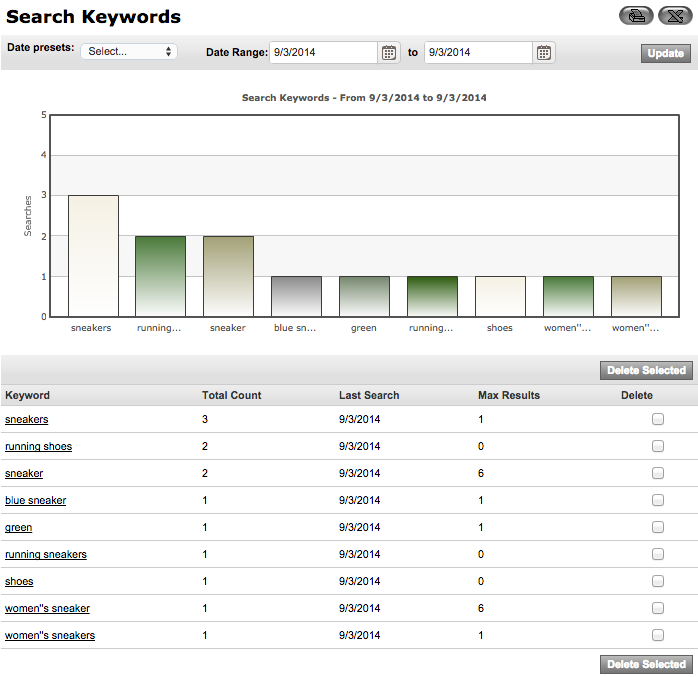 Search Keywords: Lists all search keywords entered by customers on the site within the timeframe specified. The report displays the keyword, total number of times the keyword was entered into the search field on the site, the most recent date the search keyword was entered on the site, and the number of product results displayed from the search keyword. Sales By Payment Method (Offline): Displays the number of orders for which an offline payment method was used within the specified date range. The report lists the offline method name, total number of orders the payment method was used on, total value of the orders (includes shipping and tax), total shipping value on the orders, and total tax on the orders. This report does not list individual order numbers. Sales By Payment Method (Online): Displays the number of orders each online payment method was used on for the selected date. The report lists the online method name, total number of orders the payment method was used on, total value of the orders (includes shipping and tax), total shipping value on the orders, and total tax on the orders. This report does not list individual order numbers. Sales By Shipping Method: Displays the number of orders for which each shipping method was used within the specified date range. The report lists the shipping method name, total number of orders the shipping method was used on, total value of the orders (includes shipping and tax), total shipping value on the orders, and total tax value on the orders. This report does not list individual order numbers. Sales Summary: Lists the products sold and the customer groups that purchased them for the date range selected. The report displays the product ID, product name, quantity sold, unit price of the product, total value of the product sold, and the customer group that made the purchase. The customer group section of the report displays the customer group name, number of orders purchased within the customer group, total value of discounts for the customer group, total value of shipping charges for the customer group, total tax value for the customer group, and the total order values (includes shipping and tax) for the customer group. Sales By Hour: Breaks down the number of sales sold in each hour of the day for the designated date range. The report displays each hour of the day, the number of orders sold within each hour, and the total value for the orders sold. Sales By Weekdays: Breaks down the number of sales sold in each day of the week for the specified date range. The report displays each weekday, the quantity of orders sold within each day, and the total value for the orders sold (including shipping and tax). Sales By Day: Breaks down the number of sales sold in each day for the specified date range. The report displays the date, number of orders sold within each day, the total value of the orders sold for each day (includes shipping and tax), total value of shipping for the orders sold for each day, and the total tax on orders sold for each day. Sales By Month: Breaks down the number of sales sold in each month for the date range selected. The report displays the month, number of orders sold within each month, the total value of the orders sold for each month (including shipping and tax), total value of shipping for the orders sold for each month, and the total tax value of the orders sold for each month. Sales By City: Breaks down the number of sales placed from each city within the designated date range. This report displays the country, state, city, number of orders sold within each city, the total value for the orders sold in each city (includes shipping and tax), total value of shipping for the orders sold in each city, and the total tax value for the orders sold in each city. Sales By State: Breaks down the number of sales placed in each state for the designated date range. The report displays the country, state, number of orders sold within each state, the total value for the orders sold in each state (includes shipping and tax), total value of shipping for the orders sold in each state, and the total tax value for the orders sold in each state. Sales By Country: This report displays the number of sales placed in each country for the desired date range. The report also provides the country, number of orders sold within each country, the total value for the orders sold in each country (includes shipping and tax), total value of shipping for the orders sold in each country, and the total tax value for the orders sold in each country. Sales By Manufacturer: Breaks down the number of sales of each product, sorted by manufacturer, for the range of dates specified. The report displays the manufacturer name, number of products from each manufacturer, and the total value of the products sold from each manufacturer. Sales By Distributor: Breaks down the number of sales of each product, sorted by distributor, for the range of dates specified. This report displays the distributor name, number of products from each distributor, and the total value of the products sold from each distributor. Sales By Payment Method (Offline): Displays the number of orders each offline payment method was used for within the selected date range. The report lists the offline method name, total number of orders the payment method was used on, total value of the orders (includes shipping and tax), total shipping value on the orders, and total tax on the orders. This report does not list individual order numbers. Sales By Payment Method (Online): Displays the number of orders each online payment method was used for within the designated date range. The report lists the online method name, total number of orders the payment method was used on, total value of the orders (includes shipping and tax), total shipping value on the orders, and total tax on the orders. This report does not list individual order numbers. Sales By Status - Payment Method: Displays the number of orders in each order status by payment method. The report will display all orders placed within the selected timeframe. This report contains the order status, payment method name, total number of orders in each applicable order status, subtotal value of the orders, shipping value of the orders, tax value of the orders, and the total value of the orders (includes shipping and tax). Sales By Shipping Method: Displays the number of orders each shipping method was used on for the selected range of dates. The report lists the shipping method name, total number of orders the shipping method was used on, total value of the orders (includes shipping and tax), total shipping value of the orders, and total tax value for all orders. This report does not list individual order numbers. Sales By Promotion: Displays the number of times each promotion has been used on orders for the selected dates. The report displays the promotion name, number of orders the promotion was used on, the value of discounts the promotion created, the number of orders that received free shipping due to the promotion, and the number of orders that received a free product due to the promotion. This report does not list specific order numbers. Sales By Referrer: Lists number of sales generated from each referrer URL for the date selected. This report displays the referral URL, number of orders generated, total value sold on the orders (including shipping and tax), total shipping value on the orders, and total tax value on the orders. Orders By Date: Lists all orders placed within the designated timeframe. The report displays the date, order number, order status, customer name on the order, payment method used on the order, order subtotal, shipping value on the order, tax value on the order, and total value of the order (includes shipping and tax). Top Customers: Lists all customers that have placed orders within the desired date range. This report displays the customer name, company, number of orders placed from the customer, and the total amount spent. Top Groups: This report lists all customer groups that have placed orders within the chosen date range. The report displays the customer group name, quantity of orders placed from the customer group, and the total amount spent for the customer group. Top Categories: Displays the number of products and the total value sold within each category for the selected date range. Top Products: Lists all products in the store which have been sold within the chosen date range. 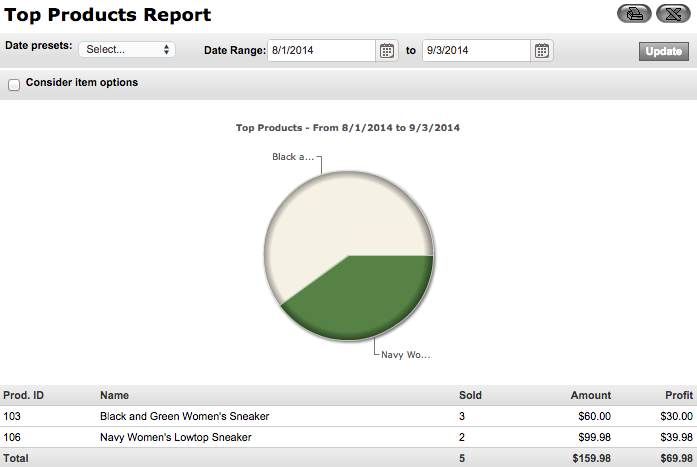 This report displays the product ID, Product Name, and the total quantity sold for the date selected. Pages: Lists the number of hits each page on the website has had within the designated timeframe. This report displays the website path/URL and number of hits for each. Referrers: Lists the number of hits the website has had due to a referring URL. This report displays the referral URL and number of hits. Browsers: Lists the Internet browsers being used by customers to view the website. This report displays browser type and number of hits. Resolution: Lists the browser resolutions customers are using to view the website. This report displays resolution size and number of hits. O.S. : Lists the operating systems being used by customers to view the website. This report displays operating system and number of hits. Visitors/Hits (Daily): Breaks down the number of unique visitors and page hits to the website for the specified date range. This report displays the date, number of visitors for each day, and number of page visits for each day. Visitors/Hits (Monthly): Breaks down the number of unique visitors and page hits to the website for the selected date range. The report displays the month, number of visitors for the month, and number of page visits for the month. Bandwidth Usage: Displays the amount of bandwidth used on the site each day for the designated timeframe. The report lists the date and the amount of bandwidth used per day. This report does not list what elements are using the bandwidth. Conversion: Displays the conversion rate from the number of unique visitors to actual sales on the site for the chosen date range. This report lists the number of visitors, total orders, completed orders, and the conversion rate (in percentage form).